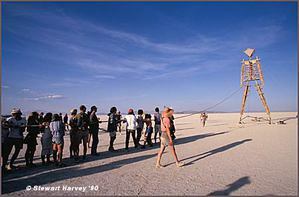 The celebration of Burning Man’s annual fire ceremony began in 1986, created by Larry Harvey and Jerry James. For the next four years, its annual fire party was held at Baker Beach in San Francisco. In 1990, the Park police interceded to prevent the culminating conflagration of the statue. This was a transitional moment for Burning Man as the event evolved with a new location, a change of date, and the beginning of a new meaning for the celebration. This viewpoint is an observation of the events surrounding Burning Man’s presence in that year. My discovery of Burning Man was through the San Francisco Cacophony Society, an organization of randomly gathered free spirits who surf the bleeding edge of culture, space, and time. 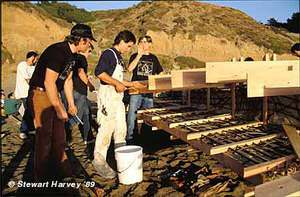 A 1990 Cacophony newsletter item invited interested people to meet in downtown San Francisco to help assemble a wooden sculpture to be burned at a San Francisco beach in an annual celebration. The building area for this event was in a parking lot in San Francisco near 11th & Folsom. I showed up that weekend with other Cacophonists, walked into the parking lot and encountered a strange sight of unrecognizable wooden structures placed around on the ground, wood saws and drills screaming their song as they cut into the wood. There was also a huge pile of rope lying around and several saw horses waiting for these wooden set pieces to placed upon them. Gradually the screaming wood cutters were replaced by shouted instructions as small groups of people collected each part and assembled it into its final form. I watched in fascination as these strange wooden shapes transformed into a large torso connecting arms, legs, and a head into a unified human form. The final connection was a rope tied to its chest. The completed statue, laying on its back, was positioned at the entrance of the parking lot. We all gathered in front of it, picking up and pulling on the rope, lifting the statue into its final vertical position. In lifting the Man upright, the group of people pulling on the lifting rope extended out into the street. As the line stretched backwards, some of us walked out into the street to stop traffic while the Man was being pulled erect. For the drivers in those cars it must have been an incredible sight, seeing this group of people tugging on a rope as this enormous wooden sculpture rose between the buildings, poised, as if waiting for something. It was my first view of Burning Man, as he stood upright, rising 40 feet into the surrounding skyline. It was an incredible vista. The statue stood there in contradiction to its environment completely surrounded by asphalt, concrete, brick and steel, the modern facades of our society. Its shape was a beacon to another time and space that spoke eloquently of ritual, sacrifice, and homage. I stared at the statue and it was love at first sight, for I knew this was something special and demanded a dedication and a commitment beyond the pale of typical societal activity. As I viewed the statue, it was the beginnings (for me) of an attraction that would span over time (1 decade and counting), space (from a S.F. beach to a dried lake bed in a Northern Nevada mountain range), and activity, from helping to build, plan and promote Burning Man to its surrounding community. I met Larry Harvey and Jerry James, the creators and organizers of Burning Man who at that moment were very busy directing its construction, for what was now its fifth reincarnation. Having seen the statue, I knew I wanted to help and we agreed to talk later on about my potential contribution to the project. Burning Man, a potent name for a very solid, but temporary, wooden icon. We all cheered The Man as he silently stood amidst his urban surroundings, working his magic of mutual attraction. We quickly lowered the statue, dismantled it, and prepared it for Baker Beach, to erect it, and burn it as an annual ritual of which had actually began in 1985. As we prepared the effigy for Baker Beach, we learned that the Golden Gate Park Police (GGNRA) had “discovered” this event and decided because of the potential fire hazard (half of Los Angeles, as it usually does around this time, was engulfed in various intensities of hill fires) to the surrounding hillside that we could not burn the statue. The police was represented by a lone officer on a motor bike who had come to Baker Beach to issue his edict. We negotiated a compromise: we could build and erect The Man, but not burn him. The agreement not to burn the statue transformed the audience into an unhappy unruly mob, as Larry realized what had been a celebration had become, to the crowd, a “mere roadside attraction.” At that point Larry realized that Burning Man at Baker Beach had reached the limits of its presentation in San Francisco, and one way or another, the statue and its celebration would have to appear somewhere else. Lowered and dismantled, the statue was put back in storage. While in storage at the parking lot, a disaster took place. Parking lot attendants had come upon the Burning Man parts and not knowing what they were, took a chain saw to them (shades of the Texan….) cutting them up into so many scraps. It was a stunning blow to Larry as he learned of the accidental destruction of the statue. It became his challenge as he decided the event would happen no matter what. With yet another work team and new materials, the destroyed parts were rebuilt and once again, the Burning Man was a complete effigy, waiting for its moment of fiery revelation. There was obviously some cosmic force at work to disengage the Burning Man’s presence, to stop the forces leading up to his intended conflagration. First, the GGNRA police forbade the fire ceremony at Baker Beach, then his accidental dismemberment at the parking lot. But a greater force of will prevailed and despite these setbacks, the wooden statue continued in its forward march, ready to accept its flaming destiny. Several Cacophonists, including John Law, Kevin Evans, and P Segal, had proposed the Black Rock desert in Northern Nevada as an alternate site. After investigating other potential sites along the coast of Northern California and discovering that none were suitable for the Burning Man ceremony, Larry accepted on faith that the Black Rock just might be the place for the wooden statue’s intended celebration. Having decided to transfer the Burning Man celebration to Northern Nevada it was merely a matter of organizing the trip, renting a truck to transport The Man, and getting our butts out to the desert. It was also decided that Labor Day weekend would be a perfect time to go into the desert. On the day of departure, there were about 80 – 100 attendees, most of whom had gathered at our launch point in Golden Gate Park. As people showed up, they brought all manner of luggage including backpacks, suitcases, duffel bags, ice coolers, camping gear, hatboxes, and clothes bags. Most of this was piled in front of the Ryder truck. (Let’s not forget the woman who only brought her massage table, no food, no extra clothes, no water, nothing else!). Many people were hitching rides in already filled cars, so the truck would not only bring out the Man, but everyone’s luggage that could not be transported in other cars. As people gathered round, there was this great electricity in the air. Here we were, all urbanites, children of the city used to running water, TV, buying groceries at our convenience, all preparing for a journey to a desolate and stark region of primitive expanse with wild weather and days of 100+ degrees of sun-baked landscape. The Black Rock was a playa, a dried lake bed encircled by a mountain range, sitting undisturbed for the last 30,000 years, a flat beachhead of dried mud for hundreds and hundreds of miles. And we were going there. “O.K., let’s do it!” The back door of the Ryder truck was opened, our group jumped up and into the truck, others formed a fire brigade and began to feed us luggage. As the trunks and suitcases flew into the truck, it felt like an evacuation from some kind of natural disaster, which in a way it was as one thinks about the rat race of surviving urban living. As others gathered to watch, I was struck by the enormity of the moment. We were packing up, getting ready to leave the city to do what? It didn’t matter. It was the big A — an adventure into the unknown. It was more than leaving the city culture and shedding our urban upbringing. 80 people had suddenly become 80 friends who cared for each other, had made a commitment to follow this strange wooden statue to the desert and live with it till its last moments when wood was to become ash and smoke. Did we know what we were doing? Probably not. Did we care? Yeah! We knew that whatever we were doing, it would be different. If only for that weekend, we were going to put some meaning into a special experience, recreating an ancient pagan ritual that was actually 1000s of years old. In Cacophony, we called these adventures; a ‘Zone Trip.’ The Zone was some other dimensional place, it could be the past, the future, something weird, it didn’t matter. We were going there, and we would challenge it and be better for it. It was that damn statue working its magic on us. First we followed it to the beach and now to the desert playa in the middle of nowhere. The truck was loaded, and its back door slammed shut. People scurried to their cars — it was time to get out of Dodge. We formed a loose caravan and drove from San Francisco endlessly into the night. Never having done this before. It was a miracle that we even got there, but we did. Just after dawn, we arrived in the town of Gerlach (pop. 250) literally the last town before the desert. Having had breakfast at Bruno’s cafe (the only cafe in the town), the group reformed and caravaned out onto the road leading to the desert. About 6 or 7 miles later, we left the road, driving directly onto the playa and stopped about 100 feet from the road. We all got out of our cars as one member drew a long line on the desert floor creating what we accepted as a ‘Zone gateway.’ This was one of our Cacophony rituals, for the zone as we defined it took on many forms, it could be a weird house, a particularly strange neighborhood (like Covina, CA), or a desolate, deserted warehouse. Today it was the base of a mountain range in Northern Nevada. We crossed the line and knew we were definitely not in Kansas anymore. As far the eye could see, it was flat, flat flat. The playa, which is a dried lake bed, is rated as the second largest and flattest (the Bonneville Salt Flats being numero uno) part of the United States at 400 square miles of a flat-as-a-board range area. Some people even claim you can see the curvature of the earth. Whatever. As one looked out into the desert playa, there may have been nothing there, but there are tons of things to see, one merely has to know where to look. After a few minutes of glad handing and yelping in delight, we all got back in our cars and proceeded on into the desert, to find our place and set up camp, and bring the Man to his rightful new home. We had arrived! Although one part of the desert looks like another, we had selected an area and begun to pitch our tents and settle in. The camp quickly became a community as we all came to terms with the surrounding desert. As this was our first time at Black Rock, we did not have much to do in the way of planned activities. There were the hot springs which we took full advantage of, and of course the surrounding desert to walk around in and appreciate. And let’s not forget the intense wind storm which knocked down just about every tent awning as well as our first effort in building a center of camp ‘tent’ to hang out in during the heat of the day. But it was OK, these were lessons to be learned. We knew we would be back, so we needed to learn one way or the other what the land was like, if we were going to (albeit temporarily) live off of it each forthcoming Labor Day weekend. Having settled in, we began the process of setting up the Burning Man sculpture. His wooden parts were quickly assembled and the sculpture was laid out on the desert floor, ready to be set up vertical, to become the watchtower of our camp. The moment had arrived – it was to be our first lifting ceremony. The entire camp had gathered in front of the sculpture, standing next to a thick rope that emanated from the sculpture and extended onwards for about 100 feet. On a series of commands, we lifted the rope up, pulling, and began slowly stepping back, pulling on the rope. Quickly the sculpture began to rise, soon it was standing upright. We pegged it to the playa floor and began cheering and hooting in joy. It was a magnificent sight, the Burning Man towering into the sky, surrounded by the beauty of the Black Rock’s barren landscape and a big beautiful, cloudy blue sky. This was definitely a homecoming. It was our first time here, but it felt right. We were a small enclave of tents and inhabitants — a desert community in the middle of nowhere. Today a colony and soon, an international community of like-minded friends — all drawn by this towering effigy — a gateway to a primal ecstasy of communion, celebration and consummation. The alignment of Burning Man in the desert is a solar configuration as he is positioned in place where the morning sun peeks above he horizon. Dawn worshippers can easily watch as the sun rises and passes through the statue, illuminating in turn, each of his chakra points. Eventually the sun pauses to cast a beatific halo around his head before continuing on its daily arc to mark the day. While Black Rock desert is largely empty, with absolutely nothing on the playa area (no trees, no grass, no hills — nothing! ), it is an emptiness whose desolate flatness of surrounding landscape is awe-inspiring. We are surrounded by mountains. Their surface run-off of winter rains has fed the playa for thousands and thousands of years. As each new day commences there are spectacular dawns, as the sky’s first light turns all shades of pink. Soon enough there is the tiniest hint of a brilliant spark hovering just behind the east mountains. Quickly the spark turns into its ompleted orb as it lifts itself over the horizon, a full dawn calling forth the day’s start. The playa holds forth with all kinds of natural wonders such as hot springs and dust devils (circular columns of dust that dance across the desert floor). There are moments of tremendous silence (especially appreciated by urban dwellers), and moments of 50 mph windstorms. I personally saw a fully assembled tent spinning end over end in one such storm. While the physical center of camp may be the town square, its spiritual center is the wooden statue that looms over the encampment watching, as it were, the coming and goings of its celebrants. Burning Man is separated from the camp to create a pilgrimage for people to leave camp to visit him. It becomes a form of the Man holding “court” as people come to pay tribute to him. Some bring bad memories to sacrifice, others are drawn as moths to flame to watch the conflagration, and for others yet, it becomes their new year, as a fire bright cleans out the old and creates a spiritual space for a new year’s growth. The evening that the Man is burned marks an ending and a new beginning. The final moment had arrived. As the countdown closed in on Burning Man’s rendezvous with the final fire, fellow Cacophonist and former carnival performer, David “Flameo” Warren, had the honor. Stepping up to the Man with a torch, he ignited his breath and a huge tongue of fire leapt forwards from his mouth, bathing the Man’s wooden legs. The flame clung to the Man and began to climb upwards engulfing his legs, then the torso, quickly reaching to immerse the entire statue. It became a spectacle of enormous magnitude, the flaming statue illuminating the surrounding area, revealing the awe-struck and cheering crowd who watched as the statue quickly lived up to its name. As the flames reached the head, there were miniature explosions as the fireworks blasted off, arcing over the fire with a halo of sparkling starbursts crowning the event. As the statue was consumed by flames, the campers gather round in celebration with a formal cocktail party. Every one was dressed in party finery: women in their elegant gowns, men in tuxedos, others in bizarre costumes. Drinks were hosted, people were toasted, there was joy in the air.